H.E. 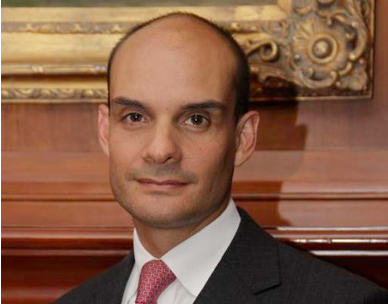 Alvaro Maldonado is currently the Secretary of Productive Development and Competitiveness of the Metropolitan District of Quito, where he proposes and dictates public policy that aims to enhance the city´s business climate, investment attraction and overall productivity for economic development. Before his current position, he was the Director of Business Development of La Fabril, in charge of the industrial national and international market. He had been in the company since September 2009. He was Executive Director of the Ecuadorian Exporters Federation for three years. He also worked as Commercial Attache of the Ecuadorian Embassy in Italy from 2003 to 2006. Alvaro was the Executive Director of the Council of Chambers and Associations of Production of Ecuador, and before that, of the Ecuadorian Association of Wood Industries. During that time he was part of the technical team of negotiators of Ecuador for the Free Trade Agreement of the Americas, presiding the Investment Workshop. He was the Chairman of the Board of Directors of the Ecuadorian Exporters Federation from 2001 until 2015. He has international experience in the Organization of American States and in the United Nations Development Program in New York City and Washington, D.C. In 2016, Álvaro was invited by the Government of Singapore to attend The International Leaders in Urban Governance Programme (iLUGP) an executive workshop targeted at international city leaders, and the biennial World Cities Summit. Alvaro graduated with honors from Externado University in Colombia on Finance, Governance and International relations, and specialized on Foreign Affairs and International Environment and Development at the American University in Washington, D.C. He attended the International Business Management Certificate Program at Georgetown University on 2016.